Our History - Serving the Region for over 65 Years. Littlefield Oil Company was established in 1946 in Booneville, Arkansas by brothers A.B. and W.C. Littlefield, and their spouses. 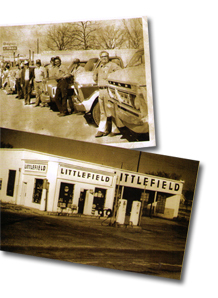 Littlefield Oil started as a bay station which served Logan County, Arkansas communities with car service and fuel. Not long after, however, the Littlefield family realized that people in surrounding communities also needed a competitive fuel source. They purchased a single fuel transport truck and began selling wholesale fuel to surrounding counties. This was the beginning of Littlefield Oil Company. Since 1946, as Littlefield Oil Company became known for superior service and competitive pricing, they have experienced remarkable growth. Over the last few years several local oil companies have joined Littlefield Oil. A & W Oil, Two States Petroleum, Campbell Oil, Cross & Sons, and Basin Oil are now part of the Littlefield Oil Team. In 2002, Littlefield Oil moved all offices to a central location in Fort Smith, Arkansas. The centralized location of the home office increases efficiency and allows easy access to the Fort Smith Magellan Fuel Terminal and the I-40/540 corridor to Oklahoma, Little Rock, and Northwest Arkansas. Littlefield Oil Company now spans over parts of four states with twelve different loading racks to pull product from. Littlefield Oil services all types of fuel users: commercial, construction, farm, drilling rigs, convenience stores, truck stops, etc. Littlefield Oil prides itself in great customer service and knowledgeable employees. Our long history of service has helped make Littlefield Oil the premier fuel service provider in the region. Let Littlefield Oil Company be your one source solution for all of your fuel management needs.